The in-game Mail system is a means for players to send each other messages and/or items. In contrast to the Trade system, Mail does not require players to meet in the same location or even be online at the same time. As a trade-off, there are fees for sending Mail that differ based upon the number and type of contents. Mail is also used for incoming system mail such as daily rewards from Group Dungeons, deliveries from crafting Hirelings, contest and giveaway rewards, promotional items, and more. Players may have a maximum of sixty (60) messages in their inbox at a time; if another player attempts to send a message to a user with a full inbox, they will be told that the user's inbox is full. In addition to the mandatory recipient and optional subject fields, Mail allows for users to pick and choose which parts of its functionality are utilized each time. This field allows for the sender to include a text message along with anything else they may be sending, or entirely on its own. This option has no fee. Mail with text only will sit in the recipient's inbox for up to 3 days, at which time it will be deleted automatically. As its name implies, this field allows you to send another user gold from your own inventory. It will not draw from your bank. This option has no fee. Mail with sent gold will sit in the recipient's inbox for up to 30 days unclaimed, at which time it will be returned to the sender. In addition to text and gold, items may also be included as attachments when sending Mail. A maximum of six item stacks may be attached to a single piece of Mail, and items must be drawn from your inventory -- they cannot be drawn from your crafting bag. Crafting materials must therefore be retrieved to your inventory first before they can be attached. 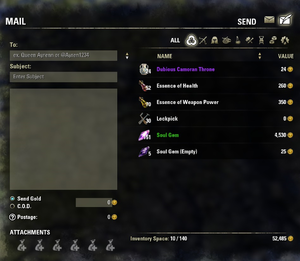 Postage for attachments is calculated based upon the NPC trader value of each item stack and paid for by the sender, but certain item categories are exempt from this fee: consumables, miscellaneous, and crafting materials. Mail with attachments will sit in the recipient's inbox for up to 30 days unclaimed, at which time it will be returned to the sender. When sending Mail with attached items, this field allows the sender to specify an amount of gold that must be paid in order for the recipient to accept its attachments upon delivery. If the recipient does not pay the fee, they may not take the attachments. The postage fee for using this method is calculated based upon the amount of gold being requested by the sender (see below). Unlike sending Mail without C.O.D., using this option requires the recipient to also pay the associated postage fees rather than the sender. For this reason, some players agree upon a total price that includes an estimated fee when using Mail for delivery, or they meet in person to avoid paying the fee. Mail with a C.O.D. will sit in the recipient's inbox for up to 3 days unclaimed, at which time it will be returned to the sender. Note that Mail which originally had attachments becomes text-only once the attachments have been removed, and is treated accordingly. This page was last modified on 24 September 2018, at 12:15.